Jameson shot glass features the label of the iconic Irish whiskey. You will also find the Jameson motto Sine Metu which is Latin for without fear. 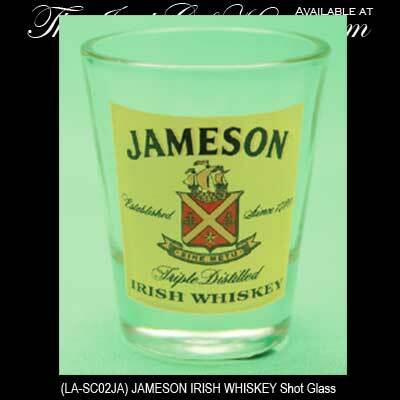 The Irish shot glass features the Jameson label in full color and it measures 2 1/4" tall. The 2 ounce Jameson shot glass from The Irish Gift House is gift boxed and is made in Ireland by Liffey Artefacts. Irish shot glass features a pewter Claddagh. Irish shot glasses feature copper plated emblems with icons that include the shamrock and Claddagh. Irish shot glass features a pewter shamrock.